But…it does tie in nicely. See…I talked about confetti a la Martha Stewart’s (now defunct? or is it back in business?) store. And this, Dear Reader, happens to be a Martha Stewart cake. I know we’ve feature, well…a few MS cakes here. But I can’t help it! First off, they aren’t all Martha’s handiwork. She just knows a good thing when she sees it. But also – and I have to admit, this is a little aggravating – I think MS Weddings is still doing a bang up job in the wedding space as tastemaker…for years and years and YEARS now! That’s pretty impressive. This cake is just adorableness at its best. 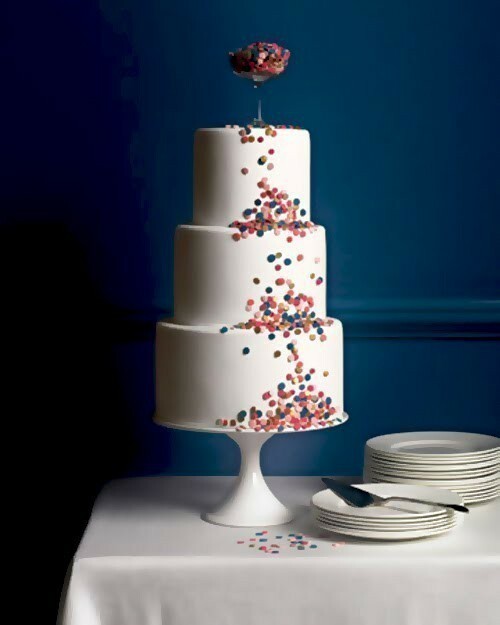 I love the old-fashioned champagne glass perched on top of the cake, spilling over with confetti that slips down, down the layers, “pooling” at every ledge, and making its way clear to the tablecloth below. Perfectly. Orchestrated. Chaos. So yes. Celebrate! With confetti! And if you don’t want guests pelting you with paper that you have to clean up, then just sprinkle it on your cake.